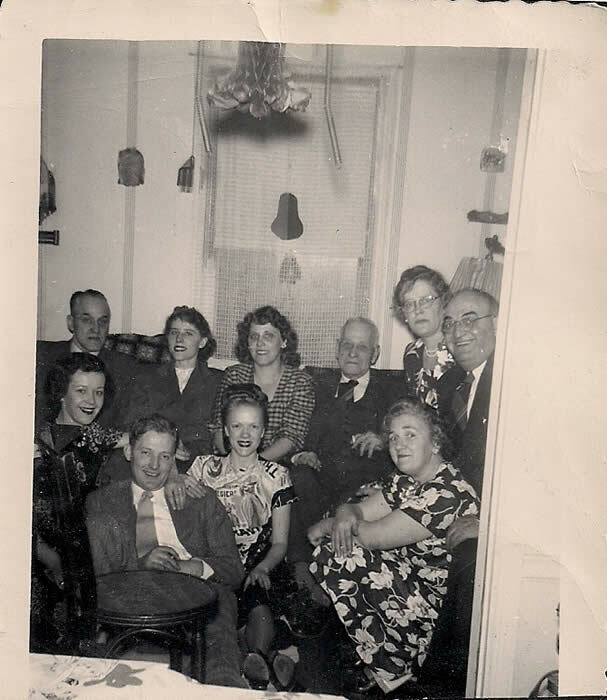 Back row: Arthur G. Oakley (1903-2000), Patricia Audett (1925-1977), Mary Grace Guilfoil Oakley (1911-1997), Albert C. Guilfoil (1867-1953), Dorothy Miriam Guilfoil Audett (1897-1956), James D. Audett (1892-1977). Front row: Dorothea Driscoll Audett (1921-1996), Joseph A. Audett (1920-2001), Dorothy Gibson White (1927-1995), Ann Despots Guilfoil (1906-2000). Location: probably in James D. Audett's house on Mason Avenue in Chicago.